This isn’t really a recipe, method or even a novel idea, but it’s something that I’ve been recently making during the week that happens to be cheap, easy, quick to prepare at the end of the work day and incredibly delicious. I love using smoked paprika in the spice blend here: it’s richness and complexity makes all of the other spice flavors sing, while the textures of all the other components work well together between two warm tortillas fresh from the oven. Combine the first five ingredients together in a small bowl. Set aside. Heat about a tablespoon of olive oil in a large skillet over medium heat. Add in the onions or shallots and saute for about 5 minutes. Add in the garlic and saute for a minute more. Add the spice blend to the skillet and mix well, sauteing about a minute more. Add in the black beans and frozen corn, sauteing for about 3 minutes. Remove the skillet from the heat and throw in the tomatoes. Place a tablespoon of oil onto a cookie sheet. Place the tortilla onto the oil and swirl it around, and then flip it over. Place into the oven to bake for 5-7 minutes, or until slightly browned. Remove from the oven and repeat oiling a fresh tortilla. Place a generous amount of the skillet mixture onto the tortilla and place into the oven. Bake for 7-10 minutes. Remove from the oven and sprinkle with a handful of the daiya. Place the cooked tortilla on top and put it back in the oven for 2 minutes more. Slice with a pizza cutter to serve. erin, this looks absolutely phenomenal. i want to reach into my computer and take out the quesadillas! i have got to make these! This is an excellent idea for an easy dinner! WOW. 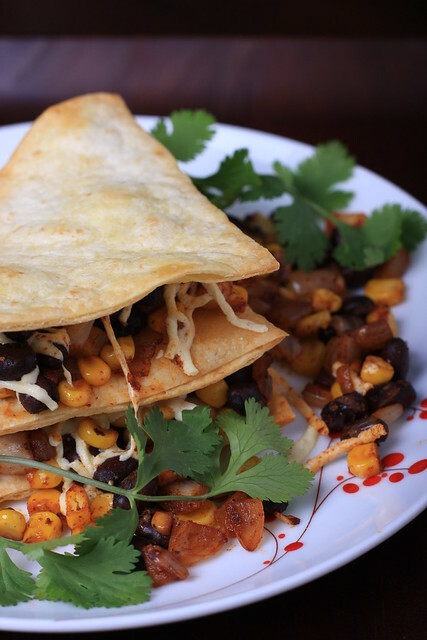 *drool* Love me some smoked paprika, and you can never go wrong with quesadillas. May have to try this this weekend!